When we started working on the book in early 2007, we could see the makings of a revolution, even through many people around us considered social media to be a fad, something that the young and crazy did. We could see that social would challenge our conventional definitions of relationships, hierarchies, control, permission, and privacy. The things that business and society held as true, sacred, and unchanging would be toppled. Hence, the need for a book to explain what social would mean and very importantly, what to do with it. Through the protagonists we highlighted in the book, we hoped that the people would see themselves, and be inspired to think act differently. What I didn’t expect was that the book would change people’s lives, including mine. There have been countless times when someone showed me their dog-eared copy of Groundswell, with note tabs sticking out all over the place. Several people shared that the book inspired them to pursue a career in social and digital technologies (thank you for joining those of us on the ‘dark side’). I have been deeply humbled that our words could have such an impact, and the feedback inspires me to do more writing and research to continue the conversation. We predicted many things Groundswell that have come to pass, but we couldn’t imagine the scale at which it would happen. One of the ideas I had at the time was that “Social would be like air”, that we’d look back at 2008 and think that it was quaint that we had to go to a specific website to “be social”. In the future, I anticipated that social would be everywhere and anywhere that we would need it to be. Mobile has made this a reality. The iPhone launched in 2007, just a year before Groundswell was published. It would still be a few more years before social apps and social sign-in would become ubiquitous. Things that we used to do alone (play games, read news stories, shop, watch cat videos) are activities are now richer, arguably better, when experienced through a social lens. Also different is the growth and dominance of social platforms like Facebook, WeChat, and Twitter. 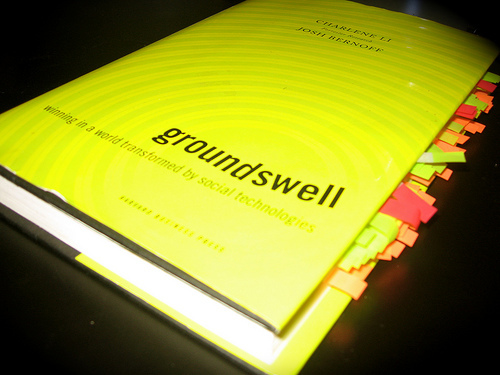 When we wrote Groundswell, most of the examples used technologies like blogs and forums. WeChat didn’t exist, Facebook and Twitter barely got mentioned because almost no organizations used them strategically. It’s been astounding to see how platforms leveraged the network effect to not just grow but also create stickiness and cement loyalty. What’s also changed is the perception of social as a force for good, from the heady days of Arab Spring to the quagmire of Russia trolls and fake news. What promised to connect us has in many ways siloed us with echo chambers and made us vulnerable to malefeasance and exploitation. And most importantly, our notion of what is private, what we are willing to share (or not) has completely shifted. For many of us, we live our online social lives with publish setting defaulted to Public. We are comfortable sharing our locations, photos, and searches with players like Facebook, Google, Apple, and Microsoft. But at the same time, we are also more demanding in terms of knowing how that data is being used, and quickly punish those who misuse it. In Groundswell, we used the acronym “POST” (People, Objective, Strategy, and Technology) as a guide to creating a social strategy. Always start with People. What hasn’t changed in the past 10 years is that it’s still about the relationships that are created and deepened by the technologies. What also hasn’t changed is that I still often get asked first by executives, “Which technologies should we use?” with little or no context to the relationships organizations want to improve or impact. In a technology-driven world, it’s still all too easy to be lured into the false belief that there is a magic-bullet technology out there that will solve your organization’s problems. And social continues to be difficult to master, and as a result, social is often relegated to the tactical aspects of the business, rather than playing a strategic role throughout the organization. That’s because social is often defined as “social media channels” like Facebook, LinkedIn, Twitter, and WeChat, which is where organizations focus on publishing marketing messages and campaign promotions, primarily on its own channels. Picture instead an organization that treats social as the conscience of the company, where executives frequently and regularly turn to social channels to learn the “truth” of what customers and employees are really experiencing, thinking, and feeling. Picture instead where the post of a dissatisfied customer is captured and shared with not only customer service, but also product development and sales because it represents a great learning opportunity on how to serve customers better. Some days, it feels like I’m living in the movie “Groundhog Day”, where the same events keep getting repeated over and over again. Most days, I see leaders and organizations grappling with how to make sense of this transforming world. When Josh and I published Groundswell 10 years ago, we had only a glimpse of what the world would look like. I can’t predict what the world will look like in 2028, but I can see some key issues that need to be addressed today by individuals and organizations if we want social technologies to provide benefits rather than be a scourge of society. First and most importantly, as individuals we need to each be better social citizens. Today’s platforms make it far too easy to mindlessly like and share. Josh wrote in his post: “Prioritize thinking over spreading. Before you share, consider what you have read. Think about it for a moment. Why does what you are reading or viewing exist? Who created it? What was their goal? Is it believable? Is it fair? Is it, perhaps, wrong? Evaluate, and then write. Comment, don’t just like. Retweet with a comment, don’t just retweet. Yes, that will slow you down a moment. But it will also add your intelligence to what you share.” All of the best algorithms tackling “fake news” wouldn’t be needed if we would each use our brain. In the course of becoming better social citizens, my hope is that we can also become better citizens in the world, where we are connected beyond our immediate communities. This was one of the biggest promises of the social era, but it hasn’t been realized because we haven’t actively practiced citizenship. We haven’t taken the time and care to be citizens and create these new societies. Being citizens requires compromise, where we express our needs, but are willing to give some of them up for the betterment of the whole. I have recently started to organize the seminal digital books from 1996 – forward. Laura Lemay’s HTML Bible from the mid-90’s, The Cathedral and the Bazaar, the Cluetrain Manifesto, Naked Conversations, and Groundswell are all classics in my opinion and should by on everybody’s shelf that works in this crazy space and cares about history as a predictor of the future.